Curable Disease: Meat tastes sweet and sour fruit, cool, strong astringent, aromatic smell. Efficacious organ lubricates lungs, stop coughing, peluruh urine (diuretic), peluruh fart (carminative), improves digestive disorders, stimulate saliva, and lowers blood glucose levels (hypoglycemic). Efficacious for menstrual peluruh Bark. The results showed the seeds, leaves and bark jamblang possess lower blood glucose levels (hypoglycemic effect) in patients with type II diabetes mellitus. 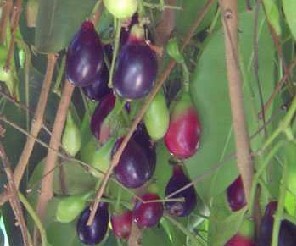 Research in India get the result that the fruit jamblang potential as a male contraceptive drug. In animal experiments, jamblang can prevent the onset of cataracts due to diabetes. Jamblang also lowers the risk of atherosclerosis up to 60-90% in diabetics. This happens because the content of oleanolic acid on jamblang can suppress the role of free radicals in the formation of atherosclerosis.